Draw entity relationship diagrams (ER diagrams) easily with ER Diagram tool - ConceptDraw! The main tool of domain modeling at the stage of conceptual design is the Entity-relationship model, also called ER-model. Modeling domain data structures is based on the usage of graphical tools - ER-diagrams (Entity-Relationship diagrams). Simply put, it is a visual representation of relationships between entities. The core concepts of ER Diagram are entity, attribute and relationship. An entity is an object of the real world that can exist independently. An entity has instances which differ in attribute values and allow unambiguous identification. An attribute is a property of the essence. For example, the entity named Book is characterized by attributes such as author, title, price, publishing house, edition, number of pages. Specific books are instances of the book entity. These instances vary in the values of these attributes and are uniquely identified by the attribute "name". Attribute that uniquely identifies the instance of the entity is called the primary key. It may also be a composite key, which is a combination of several attributes. A very important feature of the entity-relationship model is that it can be represented as a graphical diagram. This greatly facilitates the subject area analysis. There are several notations used to represent entity-relationship elements, like Crow’s foot notation, or Chen notation, and each has its pros and cons. The entity on the ER-diagram is represented in the form of a rectangle, which indicates its name. Relationship is the interaction between entities, which is characterized by degree which counts how many entities are involved in the relation. The relationship between the two entities is called binary, and the relationship between more than two entities is ternary. Attributes, entities and relationships are connected by straight lines. Relation is shown in the form of a diamond. When creating a diagram, you can follow a few obvious steps. First, you need to identify entities and relationships among them. The following step is to identify the semantic information in the sets of relations (for example, whether a certain set of connections is a 1:n relation). Then you should define relationships cardinalities and determine attributes and their values sets. The final step is to organize the data in the form of entity-relationship connections. As an example, let’s imagine a database designed for storing information about some bank activities. The bank has affiliates, which are controlled by managers. Customers of the bank have different types of accounts - current, term, demand, deposit, card account. Branches handle these accounts. The described domain will be called Bank. Let’s determine four entities: the Affiliate, the Manager, the Account, the Customer and some relations among them: the Manager controls the Affiliate; the Affiliate handles the Account; the Customer has the Account. ConceptDraw DIAGRAM with Entity-Relationship Diagram (ERD) solution serving as ERD software allows you to visually create Entity Relationship diagrams (ERDs) for various database systems, it supports ODBC-compatible databases (Oracle, MS SQL, InterBase, MySQL, MS Access, Firebird and others). The built-in scripting language allows to connect to ODBC-compatible databases and automatically generate the structure of a database (reverse engineering of the database structure). ConceptDraw ER Diagram Tool works across any platform, meaning you never have to worry about compatibility again. ConceptDraw DIAGRAM allows you to make Entity-Relationship Diagram (ERD) on PC or macOS operating systems. When creating an ERD our ERD software considers individual database options such as referential integrity, constraints, domains, triggers, stored procedures, functions, packages, views, sequences, synonyms etc. ConceptDraw DIAGRAM is a very easy-to-use and intuitive database design tool and ER Diagram tool which can save you hundreds hours of work. 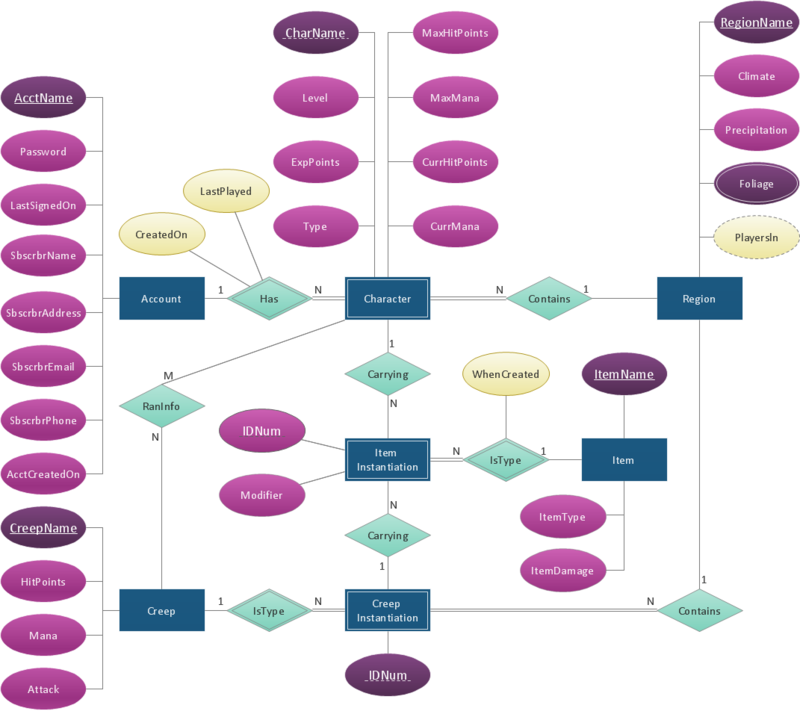 Entity-Relationship Diagram (ERD) solution contains 2 libraries with 45 predesigned vector graphic elements, collection of professional ERD samples, examples and templates. ConceptDraw DIAGRAM is excellent choice of database designers for modeling, reverse and forward engineering of relational databases. It is not only an excellent tool for ER Diagram, but also the one that allows you to reverse engineer already existing database structures, create detailed HTML, PDF or PPT reports. The ER Diagram samples you see on this page were created in ConceptDraw DIAGRAM using the Entity-Relationship Diagram (ERD) Solution. They successfully demonstrate solution's capabilities and professional results you can achieve. An experienced user spent 10 minutes creating every of these samples. Use the Entity-Relationship Diagram (ERD) Solution for ConceptDraw DIAGRAM software to create your own professional looking ER Diagrams quick, easy and effective, and then successfully use them in your scientific or education activity. All source documents are vector graphic documents. They are available for reviewing, modifying, or converting to a variety of formats (PDF file, MS PowerPoint, MS Visio, and many other graphic formats) from the ConceptDraw STORE. The Entity-Relationship Diagram (ERD) Solution is available for all ConceptDraw DIAGRAM or later users.